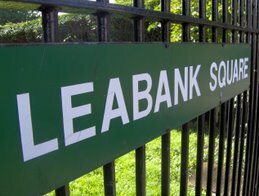 Leabank Square: Tools, Tools, Tools!!! That was very nice of them, I hope it wasn't a bribe though! Hello Sóna, what a lovely gift! I know how peeved you were when all your tools were nicked, and so this was a great gesture from the ODA. I also got the email link from S, and laughed my head off! Those wasters at the monitor place are so bitter about their balls having been cut off, they find it hard to find anyone who cares for them, so they start picking on us! I think you should do a womens institute style calendar for Leabank Square next year - with you and all the ODA people that donated the tools - just to make those old geezers even sadder! Were THEY ever going to donate some tools to us? Or were THEY ever going to do something useful for the Wick? What great neighbours the Olympics are turning out to be? I know we've got you to bark at them from time to time, but like mature adults, we've dealt with our issues, and moved on. This is a lovely neighbourly gift. But keep that bark in reserve for any other hiccups OK?